The Tony Knowles Coastal Trail follows the shore of Cook Inlet from downtown Anchorage to Kincaid Park. Running along coastal marshes, over forested hills and passing one of the most dramatically altered landscapes of Anchorage, the trail is perfect for biking, walking and even wildlife viewing. It’s not unusual to pass eagles or moose along the way. 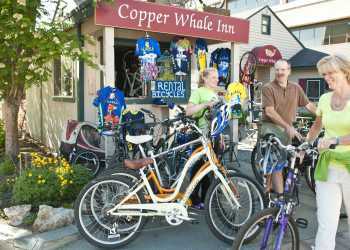 The paved path runs 11 miles, and bike rentals are an inexpensive, easy way to explore every stretch. Leaving downtown, the trail hugs the coast, with great views of Mount Susitna, also known as Sleeping Lady. On clear days, Denali and nearby Mount Foraker loom on the horizon. The trail crosses the site of some of the worst damage from the 1964 earthquake. Earthquake Park, Point Woronzof and many trailside benches and parks offer great views and convenient rest points on the trip further south. Some of the biggest events of summer make use of the trail too. The Mayor&apos;s Marathon, Anchorage RunFest and many other distance running and cycling events make full use of the long, uninterrupted trail. Local birdwatching walks, segway tours and many other groups also hit the trail.